Need a break during a long day of sightseeing and shopping in Vienna? 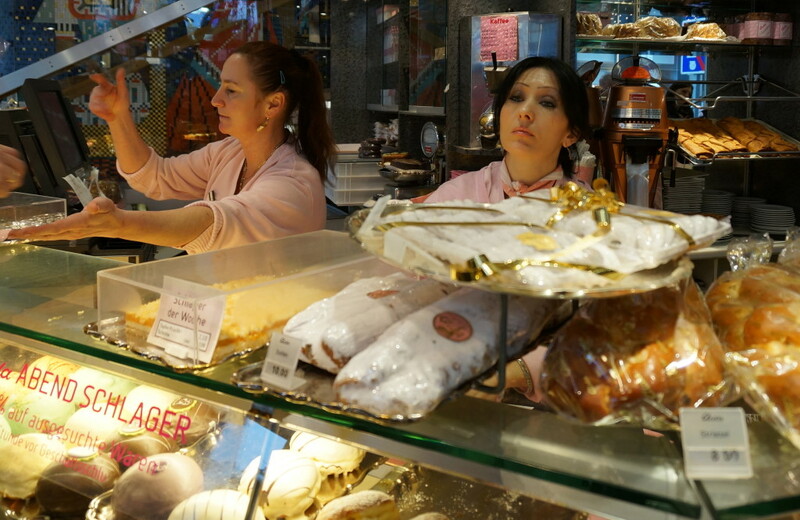 I can recommend my favorite Viennese cafes to pop into for a quick snack. Viennese cafes are perfect for a busy traveler, as you don’t need to plan your day around meal times– like an American diner, they are continuously open from early morning to late at night. But instead of a diner’s vinyl booths, stale coffee and rushed service, Viennese cafes are known for their opulent fin de siècle decor, dozens of freshly brewed coffee options, and attentive but unobtrusive service (by servers in formal, starched uniforms, no less). While at most Viennese cafes you can order everything from a soft-boiled egg to a schnitzel, they are best known for their coffee and cake. In Vienna, even the coffee is artfully served. 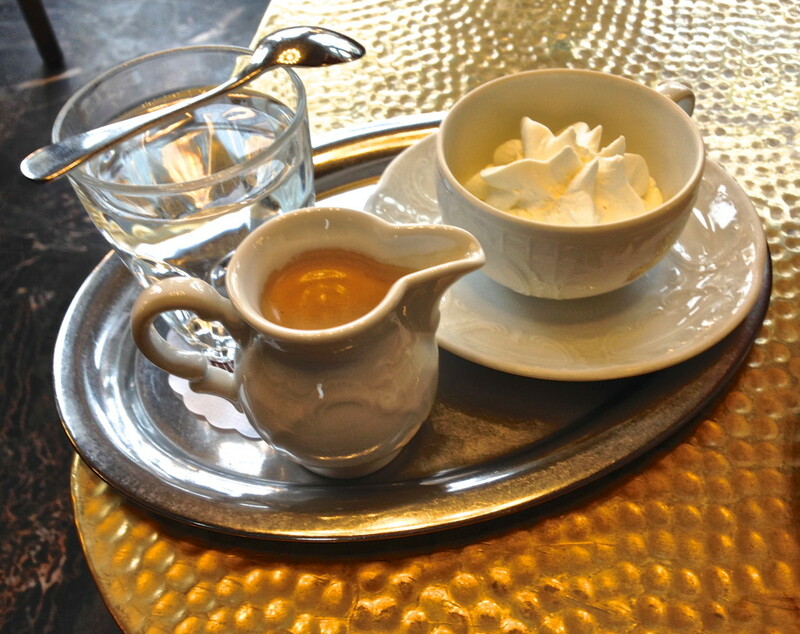 Viennese coffees beat any Starbucks, especially when topped with a dollop of unsweetened fresh cream. Viennese cakes, in my opinion, are the best cakes in the world– far less sweet and cloying than their non-European counterparts, their multiple layers and drier consistency perfectly balanced by that side of cream. 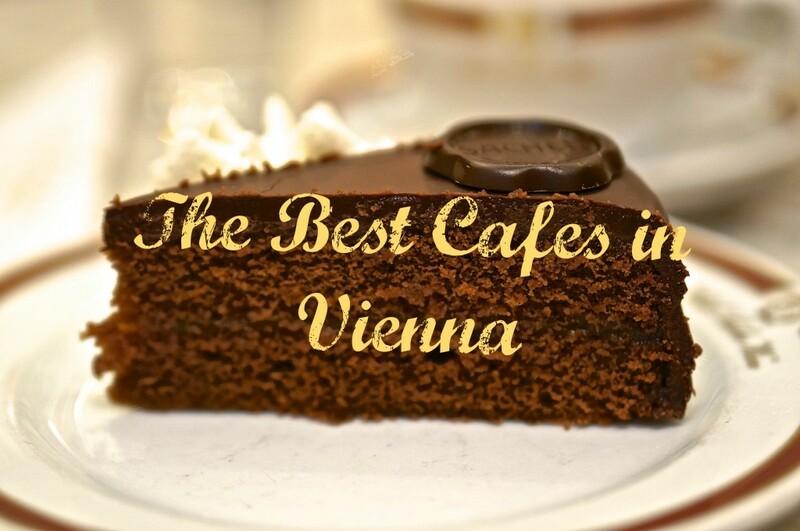 Why there is no single “best” Viennese cafe. Don’t waste your time trying to find the single “best” cafe in Vienna– there isn’t one. What’s best for you may depend on your budget, preference in decor and what’s convenient to where you’re going. I found certain cafes to be better for cake, some better for price and others better for a fancy (or cozy) atmosphere. My advice is to try a bunch of cafes and come up with your own “best” list. In Vienna, Cafe Sacher is an institution. The cafe itself is more intimate than some of the other “big names,” with multiple smaller rooms and cozy seats in a still very formal, classic Viennese setting. 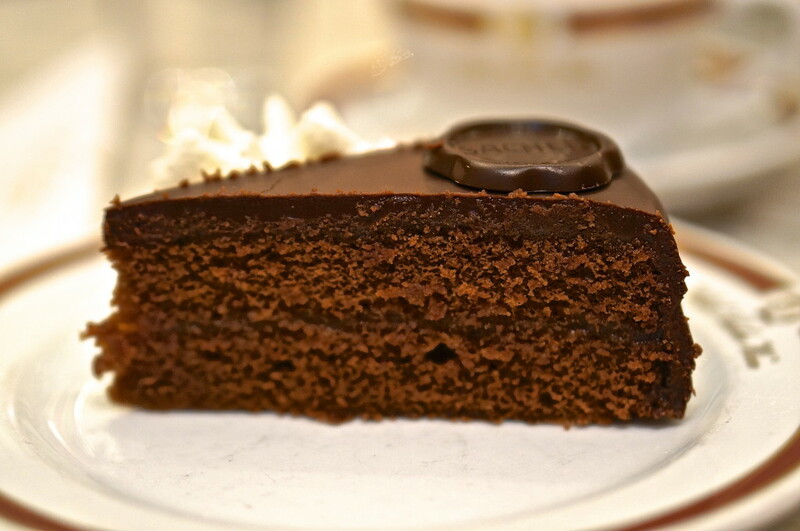 Yes, Cafe Sacher may be filled with tourists, but for good reason– the cake is delicious! Come at slightly off hours and you shouldn’t have to wait for a table. I felt ridiculous taking photos of Cafe Sacher’s starched servers, so I peeked through the window to snap this shot (those are tree branches in the way). 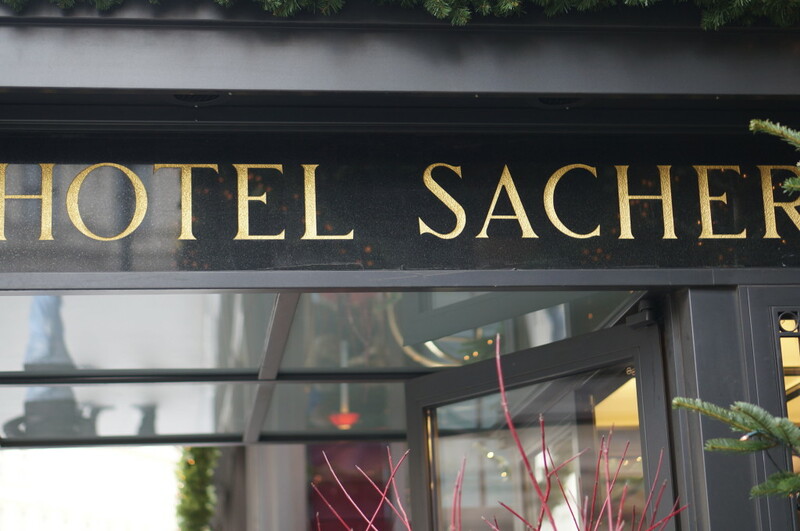 The service at Cafe Sacher is old-world traditional– servers wear perfectly starched uniforms and maintain a refreshing level of formality so often absent in service today. The Cafe Sacher menu has English translations, along with helpful descriptions of the cakes and coffees. Start with a specialty coffee, made to order. Cafe Sacher displays its cakes right in the middle of the dining area. Feel free to peruse your options before ordering. Pay no mind to the naysayers who claim the Sacher torte is overhyped– they cannot appreciate the fine texture and subtle flavor, and would probably be happier with a sickly sweet cupcake. 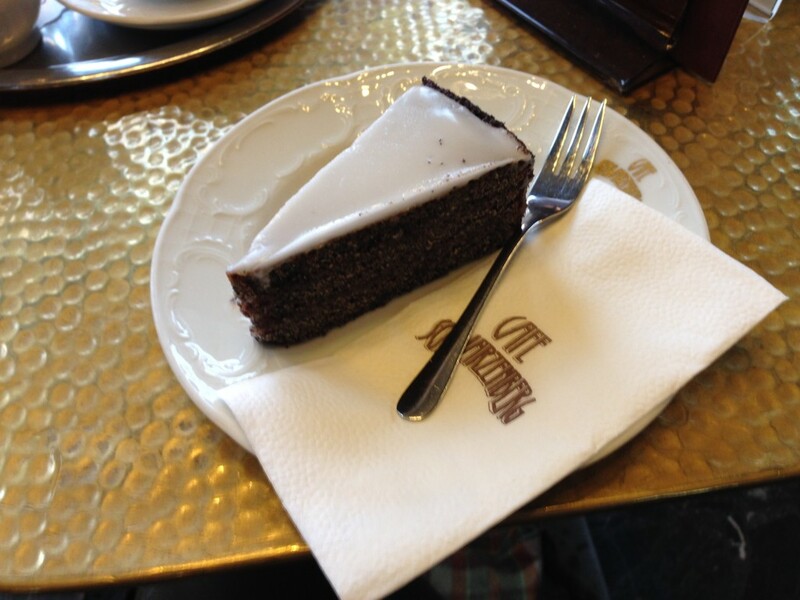 But I can never order anything other than my favorite cake here– the sacher torte. Because sacher torte is my favorite cake in the world and I have tried it nearly everywhere it’s available, I consider myself extremely qualified to crown Cafe Sacher with the title of Best Sacher Torte ever. Make sure to order your sacher torte mit creme (with cream). 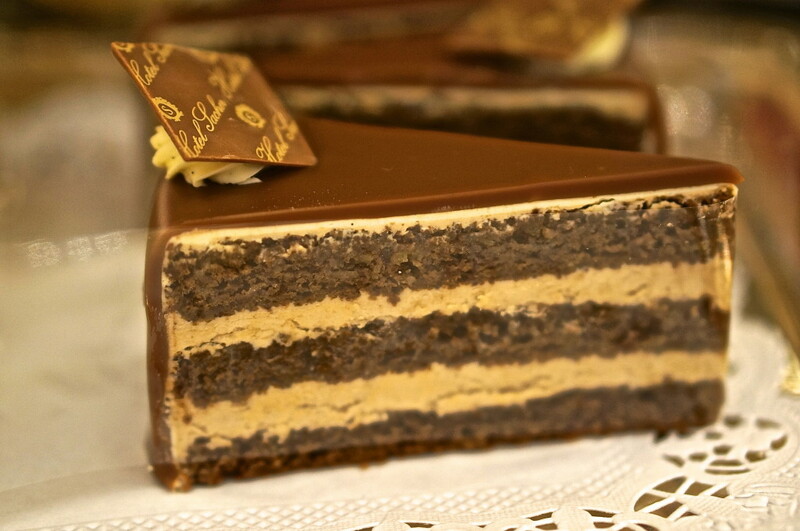 This is the imperial Torte– the take away version. The grand staircase at the Hotel Imperial in Vienna. On my first visit to Vienna, I stayed in the very grand Hotel Imperial. We stopped into the equally grand Cafe Imperial late one night for a slice of their famous cake, the Imperial torte– this time skipping the coffee and indulging in an after dinner drink instead. While the Imperial Torte was delicious, what really sets the Cafe Imperial apart is the fantastic people-watching (especially post-Opera). 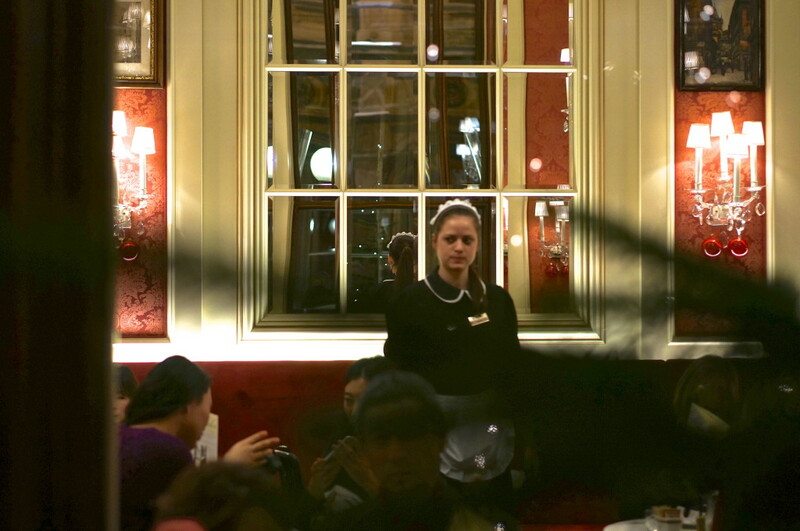 On the evening we visited, Viennese ladies dripping in furs invaded the dining room. I cooed over an adorable chihuahua, perched on a chair stacked with embroidered damask pillows, sitting proudly next to her owner. I tried to revisit the Cafe Imperial on my last trip to Vienna but it was temporarily closed for renovations. Hopefully, any changes to the decor will not impact the Cafe Imperial’s regal atmosphere. Yes McCafe is part of the McDonald’s empire. Yes, that’s a McCafe and it is part of the McDonald’s empire. The McCafe in Vienna, I quickly learned, bears no resemblance whatsoever to American McDonalds. You’ll find perfectly adequate (ok, yummy) coffee and cakes here, all takeout ready and priced right. Each morning, I ordered my cakes and coffees to go, then slipped the McCafe bag into another nondescript bag to carry back through the Hotel Imperial lobby– not that the discreet staff would have even raised an eyebrow. Cafe Sperl is a little down at the heel, which I thought adds to its charm, but may not be for everyone. Most of my travel-loving readers will be familiar with the iconic film, Before Sunrise. (If you haven’t seen it, it’s a must-rent, both for the sweet story line and the classic scenes of Vienna). I fell for Ethan Hawke quicker than Julie Delpy did, and love how the city of Vienna was a really a third character in the film. One of Before Sunrise‘s most memorable moments takes place at cozy table at Cafe Sperl, as the two young lovers lose themselves in conversation over coffee. This warm cafe is the perfect spot to duck into on a frigid night, with your lover on your arm– and even sit at the same table as Hawke and Delpy. The Sacher torte here tasted like boxed cake, but this apple strudel delivered– it is as luscious as it looks. 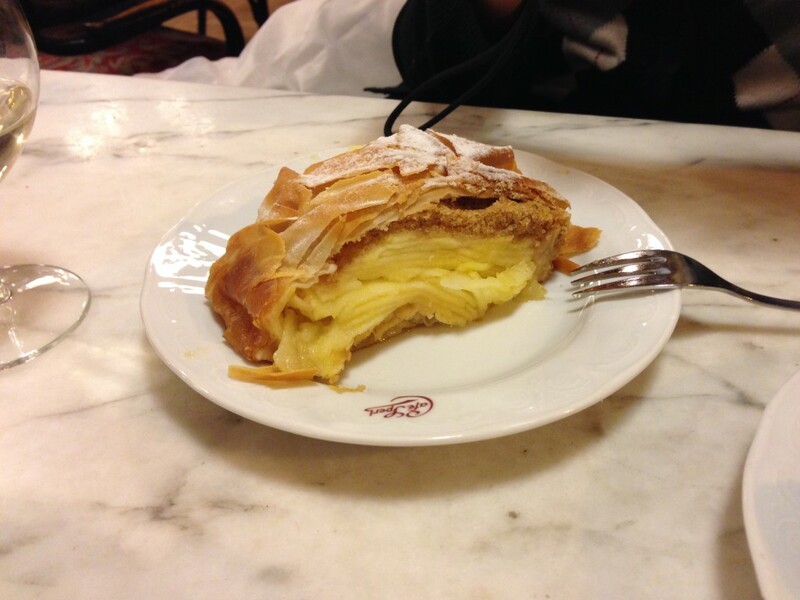 Cafe Sperl isn’t really known for its food, so stick with the coffee and the divine apple strudel. 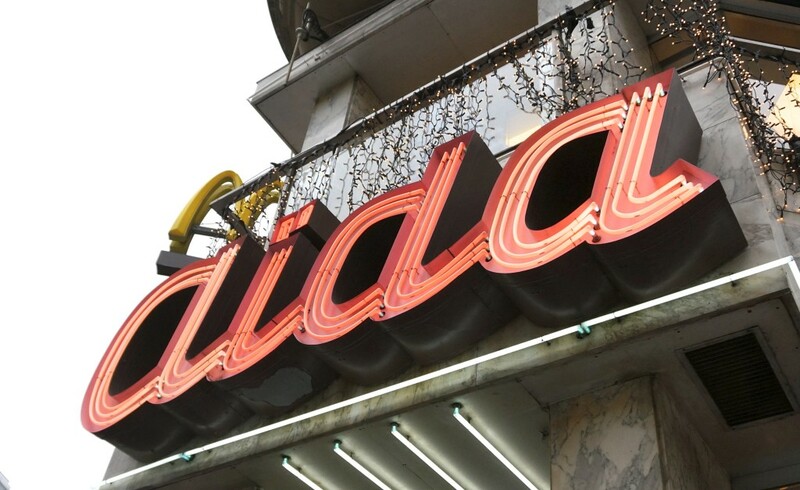 Aida is a mini-chain with several locations scattered around central Vienna. Aida has a bit of a hectic environment and lacks the charm of some of the other cafes, but its low prices and quick service put it on my recommended list. At only 4 euros or so for a slice of Aida cake, you can sample a couple for the price of less than one slice at a fancier cafe. 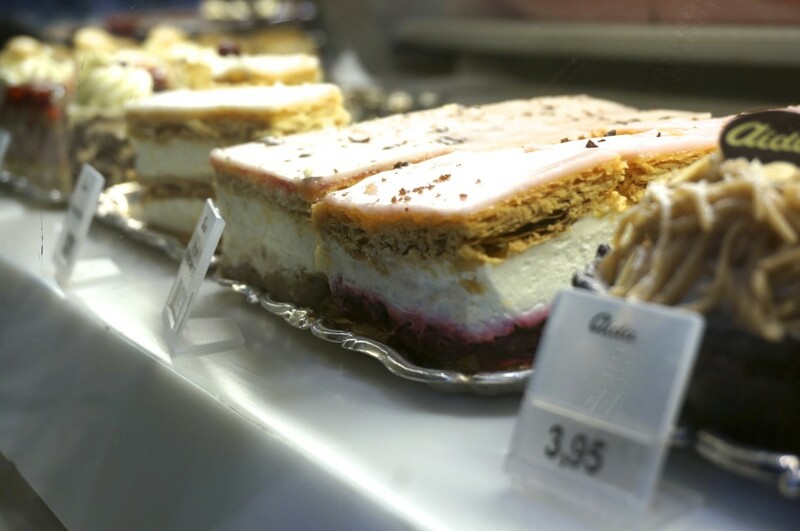 Aida cafes are perfect for a quick pit stop when you’re short on time– instead of taking time to sit at a table with waiter service, you can instead buy your cake at the counter and stand at a tall tables (where you can quickly scarf down your cake) like we did. We enjoyed bite-size samples of the cafe’s menu and can report back that it was all delicious. On my last visit to Vienna, I stayed at the elegant Hotel Bristol. The Bristol’s cafe had been under a long renovation and unfortunately was shuttered during my stay. But on my last night, the hotel hosted a preview of the new restaurant, called the Bristol lounge, scheduled to open the next day. After a painstaking renovation process, the cafe restored its original art deco features (including a gorgeous ceiling that had been covered up for years), then added modern comforts like plush chairs, perfect to collapse in (with plenty of room to stash shopping bags) for a mid-day break. Is that Salman Rushdie in the corner? I’ve visited Cafe Schwarzenberg on four separate occasions, and never had anything less than a stellar meal and experience.I loved that Cafe Schwarzenberg’s tables always seemed to be crowded with locals. I’ve had breakfast, light dinners (fantastic schnitzel), cocktails and cake at Cafe Schwarzenberg, and recommend all of them. Klimt torte at Cafe Schwarzenberg, Vienna. On my last visit to Cafe Schwarzenberg, I had a tough time selecting a cake for breakfast (yes, breakfast)– they all looked so scrumptious. I’d never heard of mohn-torte, so I took a chance on it, and was delighted with the unexpected, but delicious flavor and delicate texture. 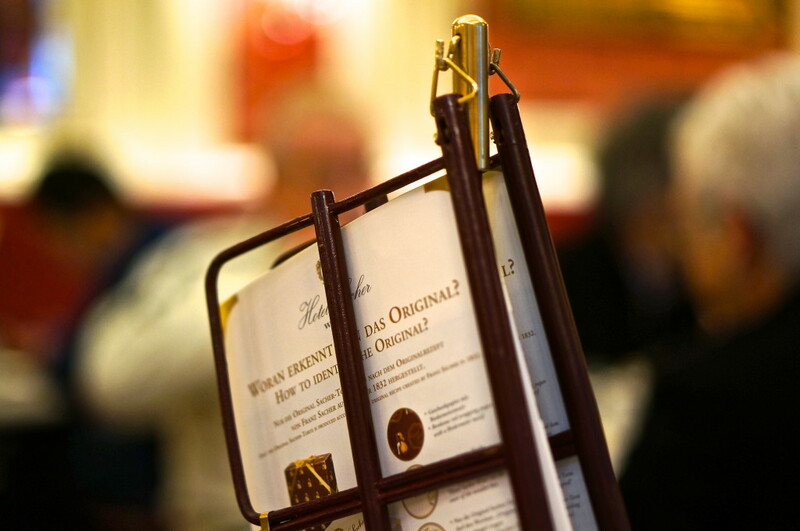 What are your favorite Viennese Cafes? Share in the comments below! Lol I thought he was pulling my leg and had a good laugh at his “joke”. Only when I google translated it later did I realize it was a translation issue– he probably thought I was nuts laughing at “poppy”. Yum! Everything looks delicious. 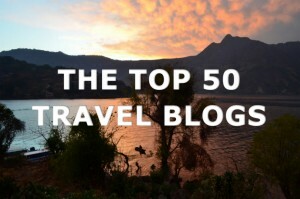 I visited Cafe Sacher and Aida on this list. I agree the latter is a no frill kinda place if you want a quick sweet. There are so many fab coffee houses in the city. I visited a few others but this was preblogging days and I have absolutely no idea where I went anymore. I do remember it being yummy though. Thanks for stopping by! I agree and regret that pre-blogging I rarely kept track of where I went, and there are many places I’d love to revisit if I could remember them! Oh no! It really is worth going back for the cake! So envious such an easy visit from London! Did you have a poppyseed pastry while you were there? My mom is part Austrian and makes the pastry every Christmas. I found a version in Austria once that tasted exactly like hers. I don’t know the name of it but its a roll of pastry spread with poppyseed paste with a light glaze on top. I know, one of my fav movies! Re: poppyseed pastry– I didn’t have that but it sounds similar to something Polish I may have tried. I just love poppyseeds for some reason. Thanks Milene! I haven’t had a “bad” piece of cake yet! Lol yes you got to taste test the Imperial Torte– I will (eventually) be writing a whole separate post on them! Not at all! I can’t re-read my post without planning another trip in my head! I’ve had this Pinned for some time and revisiting it now as it looks like I’m going to be in Vienna again later this year. What a stellar round-up! Now I’m drooling and seriously craving Sacher Torte. Only place I’ve been to on this list is Aida and, I agree; it is hectic and crowded but I didn’t feel out of place as we were casually dressed and our daughter was in tow. I’d like to try the “fancy pants” places on my upcoming trip! Oh Vienna again! It’s just one of my fav cities, so easy to enjoy, not too many “must-sees” to feel obligated to run around to see. You must report back! I miss that Mohn cake every time I look at the photo. Would love to hear your favorites (anywhere in the world of course!). 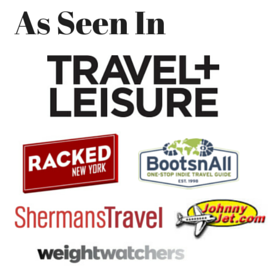 What should I try on future travels? Oh my goodness, all of those cakes look so yummy! I’m thinking four days in Vienna can’t possibly be enough to try all of those places 🙁 I hope I’ll visit at least a few, though! Jolanta– that’s why I started eating cake for breakfast (the cafes are open and you can order it any time)! It’s the only way to fit them in on a short trip lol. Gerstner – best strudel, sour cherry in particular. Do you have to pay for refills on coffee? Glad I discovered this post. Now I am planning to spend more time on Vienna so I can eat my birthday cake there! I agree that Demel is better than Sacher for cakes. Huge variety, delicious and not so busy. If I recall though, the coffee wasn’t as good as I expected. Café Landtmann has a good variety of coffees. Thanks, will check them out next week!!! Thanks I’ll check them out next trip! I love Vienna and everything in it! Your cafe roundup makes me want to go back. Soon! Next time you’re there, try Cafe Central. The service is friendly but formal, the selection is huge (although I always get Apfelstrudel), and the architecture is stunning. Guten appetit!